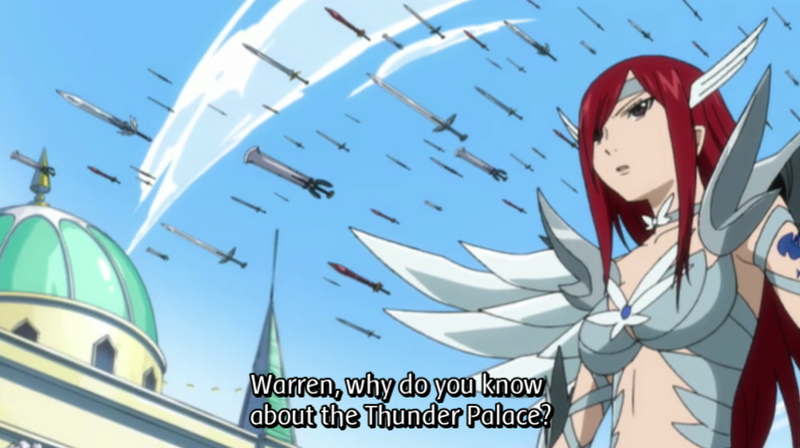 Gray continues to look for Warren, while Erza continues to summon up to two hundred blades. 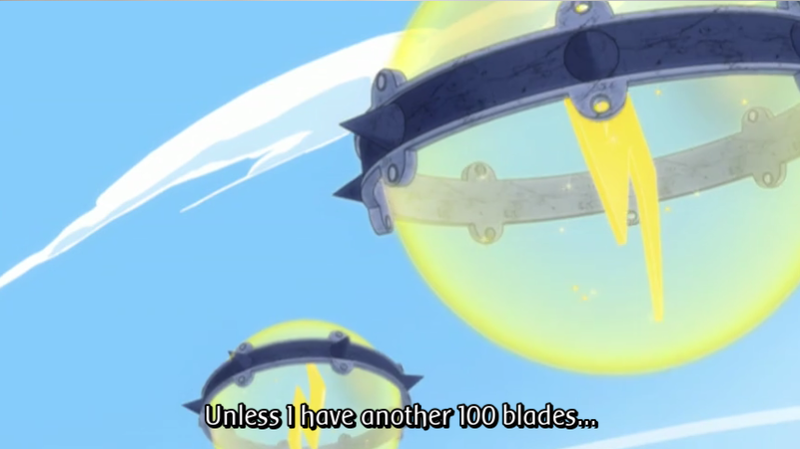 It’s quite obvious that she’s reaching her limit, but is still one hundred blades short from being able to destroy all the lachryma. Gray manages to find Warren, who uses his telepathy to wake everyone up. Surprisingly everyone is able to come back to consciousness despite having been knocked out and worn each other out fighting. But it’s shonen, what do you expect? Erza reveals that the girls are alright, leading to the relief of many of the guild members. Of course there is some left over bitterness because of the fight, and the guild starts arguing amongst each other and fighting about who would have won in better circumstances. Either way, things aren’t looking good on the cooperation front. 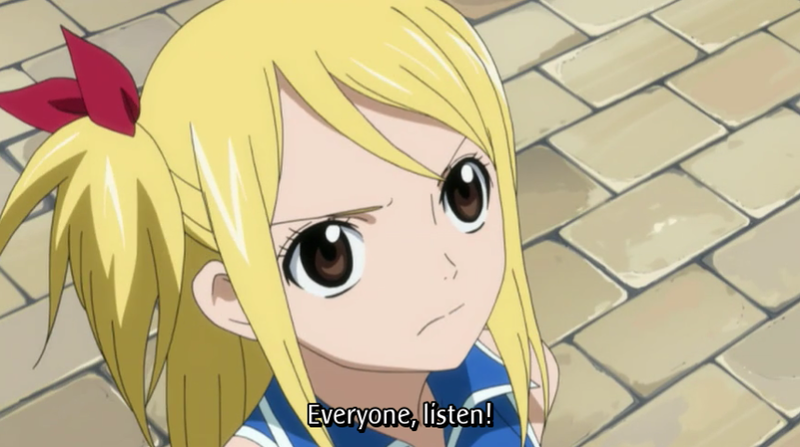 That is until Lucy gives her cheesy friendship speech that is not present in the original manga. Now in the manga the group gets over their differences themselves, and destroy the Thunder Hall as one. In the anime they don’t start cooperating until Lucy’s heartfelt speech brings them back to their senses. Cheese is cheesy, but I can’t blame the anime team for doing it that way. In some storylines in the manga it is pretty easy to forget that Lucy is in fact the main character alongside Natsu. Her bringing everyone back to their senses makes sense narratively, bringing the focus back on her as main character. 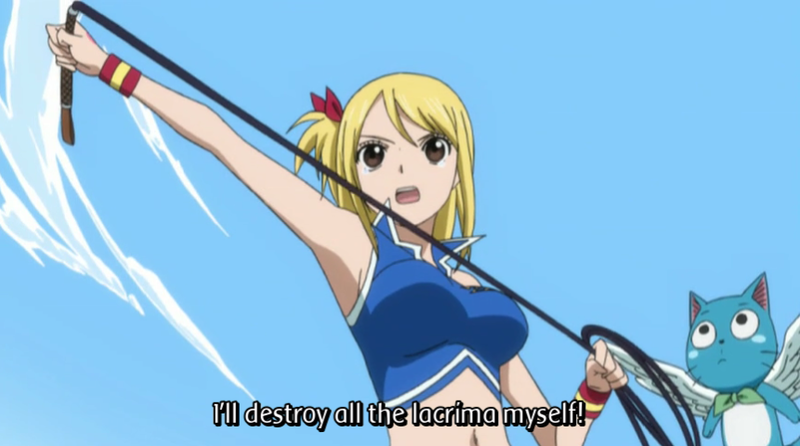 Considering that this storyline was originally going to be the finale of the series, it makes sense to give Lucy’s character a stronger climax than the manga allowed for. It makes sense, though it will be pretty painful for manga purists, and for anyone that hates cheesy friendship speeches. With Lucy’s appeal to their reason the guild gets their act together and attack the lachryma as one. Lucy has Happy fly her up to the lachryma, attacking one directly with her whip. This was a pretty cool sequence, as the manga doesn’t really show how she attacked the lachryma. Happy…you’re her only way of getting down safe. Maybe you shouldn’t be attacking those? 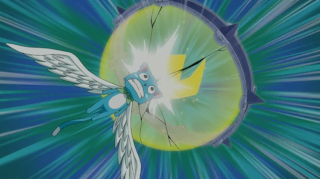 The attack on the lachryma is pretty epic, accompanied by the epic music that the soundtrack is. Good scene, and then everyone is struck down by lightning. Now if this were a series that was more serious in tone there would have been deaths here. I was thinking about this while writing this article, and considering that Fairy Tail is one of those series where no matter what, you don’t have to be afraid for the characters’ lives. But I can imagine that this scene would play out a lot differently in several other anime. 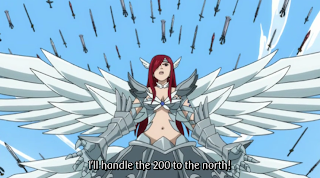 And realistically it should have ended in death, especially with Erza dealing two hundred times more damage than anyone else. But the issue of death has already been treated in the past arc, and it would have been in bad taste to kill her off now. As such, everyone getting struck down by lightning comes off much more comically than I imagine was Mashima’s intention. Natsu chews Laxus out for trying to be master, even though he never tried to approach any of them as a friend. Laxus, ignoring what Natsu is saying, decides that since his plan failed he’s just going to take over the guild by force, like he should have in the first place. Natsu is quickly overwhelmed by Laxus, who just about kills him, but for Gajeel’s last minute intervention on Natsu’s behalf. 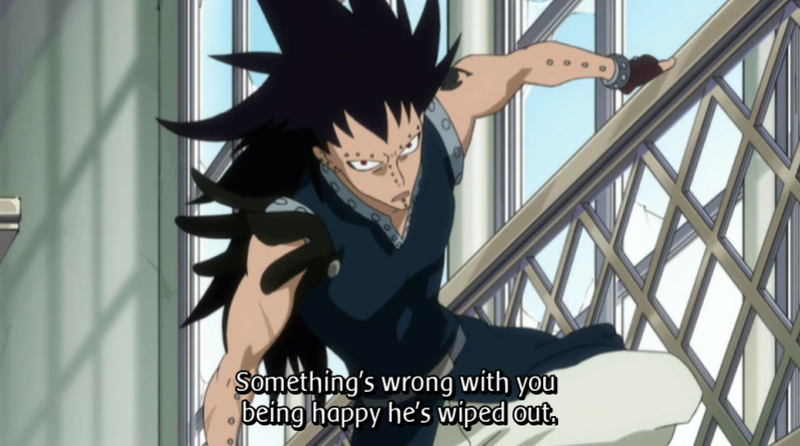 I’ll admit, hearing Gajeel talk about how messed up Laxus is for being happy at apparently having killed his guild member sounds a bit hypocritical considering how Gajeel treated his own guild members. Natsu and Gajeel team up, despite Natsu’s protests, realizing that the personal satisfaction gained from beating Laxus one on one is unimportant compared to stopping him. This team up is something I’ve been waiting for ever since Gajeel joined the guild, so I really haven’t been waiting for very long, but it starts off with one of the best lines ever. And I won’t tell you what it is, you’re going to have to watch the episode yourself. It’s worth it though. 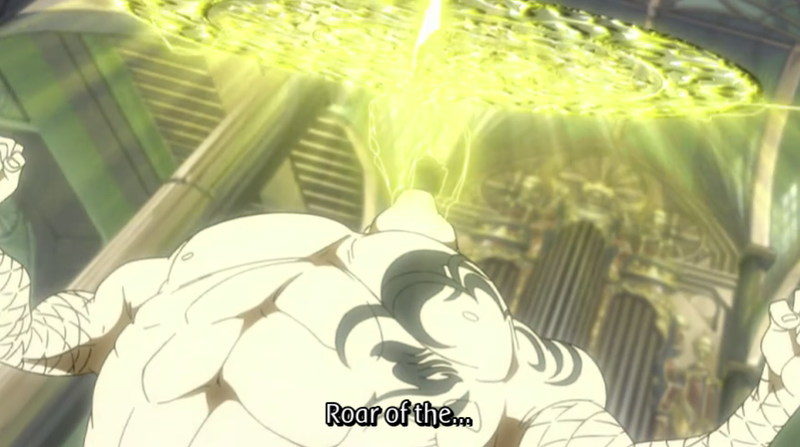 If there’s one thing I can say for Fairy Tail it’s that badass music makes for some badass fights. Nothing like the classic theme to set the mood for a high powered magic fight. Natsu and Gajeel give Laxus a beating initially, but it’s not enough to put him down. 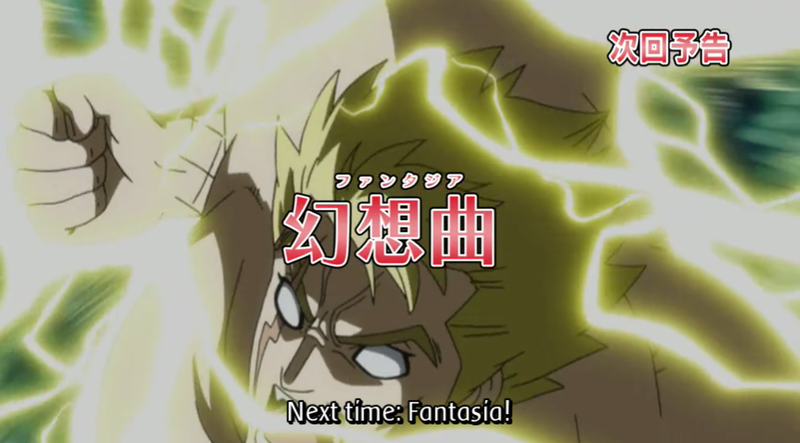 And then, in the spirit of all great shonen series, Laxus reveals a hidden power up. He too is a Dragonslayer! Laxus uses his dragonslayer magic to beat Natsu and Gajeel to the point where they can’t move, the electricity of his attacks numbing their nerves and practically paralyzing them. 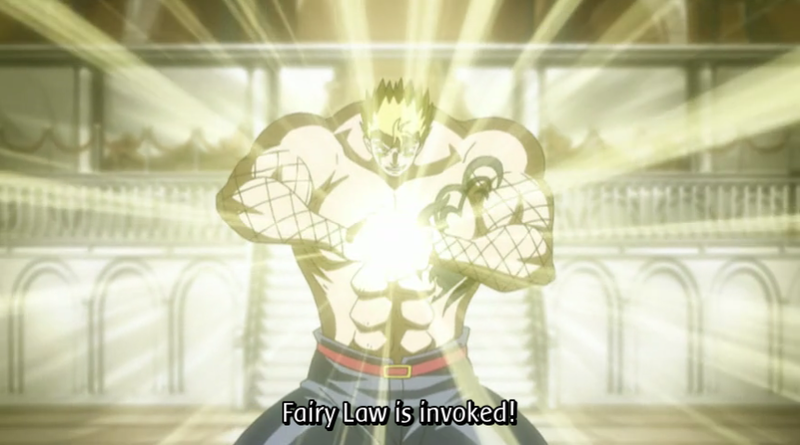 Laxus starts to use his final attack, Makarov’s own Fairy Law, the spell that targets all the caster sees as an enemy for massive damage. 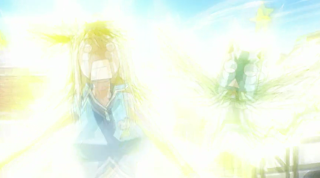 Levy shows up at the last minute, yelling for Laxus to stop because his grandfather is dying. 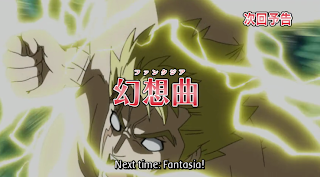 This seems to shock Laxus back into sanity, it certainly shakes Natsu. 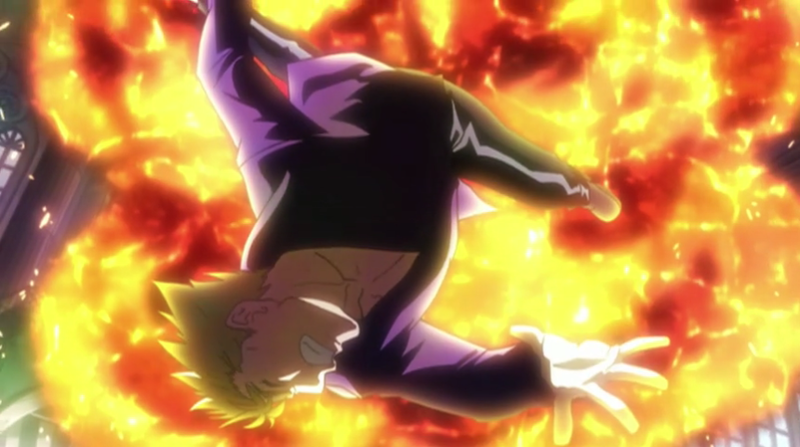 Laxus is however too far gone to care, and is actually glad that his chances of becoming master have gone up. The episode ends with him casting Fairy Law. 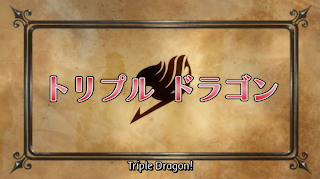 Instead of a preview of next week’s episode, there is an add at the end for a manga and OP and ED CD giveaway that makes me wish I lived in Japan. Oh well. 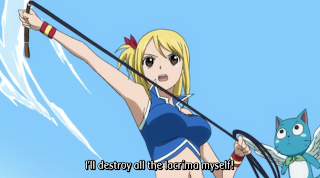 This episode was a strange one for me, because while it had some awesome moments, the destruction of the Thunder Hall, and Natsu and Gajeel tag teaming Laxus, it also had that corny speech Lucy gives which, while I understand why they did it, still comes across as far too cheesy and overall detracts from the episode. Though, I’ll be fair, this is only if you prefer the manga over the anime and hate every little change. 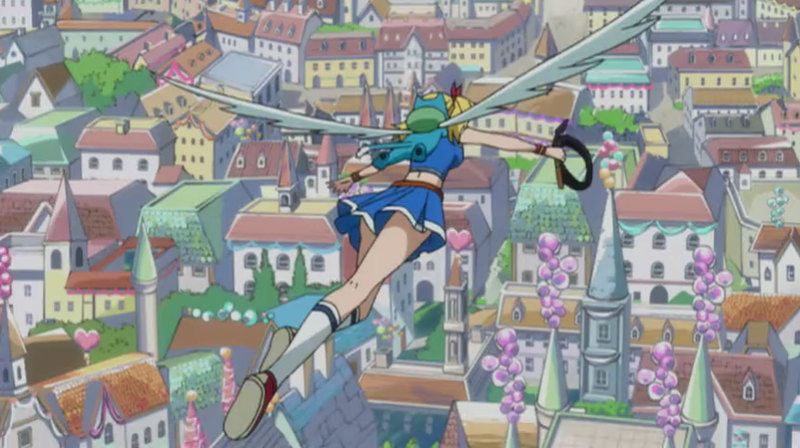 Like I said, the spirit is to focus on her as a main character, something Mashima seems to forget about in certain arcs. So in the end it doesn’t detract from the episode, even if it is corny as all heck. 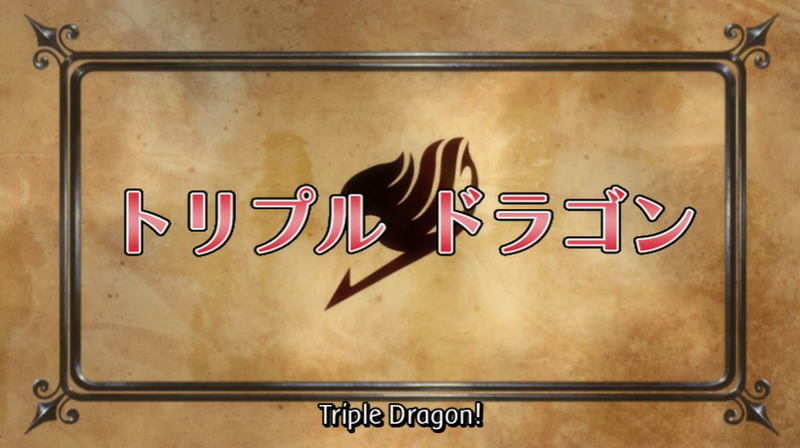 Disclaimer: You will need to purchase a membership at Crunchyroll to watch this series. They do have a two week trial you can sign up for, and at least this is a legal way to watch the show. 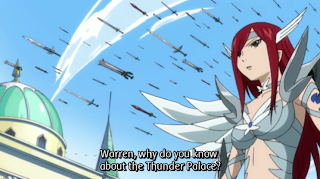 Previous Post:Anime Reviews: One Piece Episode 465 – Justice for the Winners! Sengoku’s Strategy in Action!